With the urgency of reducing our carbon footprint becoming more visible by the day, it’s great to see more and more brands making claims about their carbon reductions. As they do, credibility is key; these claims are only as powerful as our trust in them. Recognizing this, Swiss carbon finance consultancy South Pole recently launched updated versions of its Climate Neutrality and Renewable Electricity labels, used by companies to certify the validity of their claims in these areas. The updated labels make these certifications even more robust. South Pole works with companies around the globe to provide carbon credits and other decarbonization strategies. In fact, Sustainable Brands partnered with South Pole to certify last month’s New Metrics ’18 conference in Philadelphia, which achieved both the Climate Neutrality and Renewable Electricity labels. Sustainable Brands caught up with Charles Henderson, Corporate Climate Change Expert at South Pole, to learn more about the new labels and about new partnerships helping the organization scale its own impact. South Pole has been offering carbon credits and other services for years. For those not familiar with your work, what are some examples of the companies you’ve worked with and projects you’ve offset? Charles Henderson: South Pole has been working in sustainability since 2006. Originally founded in Zurich, Switzerland, the company is now operating in 18 offices worldwide. Our reach of companies that we have worked with reflects this experience and we are proud to support a variety of established, public-facing brands such as ALDO Group, McKinsey and Major League Soccer. You recently relaunched your Climate Neutrality and Renewable Electricity Labels. What do these labels cover and why are you so excited about this relaunch? CH: South Pole offers Climate Neutrality labels for companies, products and events, as well as Renewable Electricity labels for companies and events, and has been providing this certification for many years. While the ‘penguin labels’ have been a trusted choice for many of the previously mentioned big brands, we want to ensure that our labels continue to be best-in-class well into the future. This is why in the fall of 2018, our label criteria were critically reviewed and updated in order to align with new international standards and an evolving market. To give you a practical example, relevant Scope 3 emissions — indirect emissions occurring in the value chain of a reporting company — now need to be considered and included in calculations. Companies will also need to set a GHG emission-reduction plan in order to earn the label under our new criteria. Last but not least, we’re very excited about the sleek design of our new labels! Always recognisable by our trademark penguin, of course. Why would a business want to earn one of your new labels? CH: Companies that decide to take serious climate action can demonstrate their ambition to their stakeholders by using our labels. We see many brands taking ambitious action on climate — but, in an era of trust and transparency, it might be hard for their clients and partners to verify those activities. In sustainability, as in other areas of everyday life, a trusted label can give orientation and guidance. When customers see the climate neutrality label with the penguin, they can review our transparent guidelines to understand exactly what that label means and be assured that South Pole has validated all claims made by the company using it. You highlight the need for companies to prove the environmental integrity of their work. How do you ensure that your new labels are both credible and meaningful? 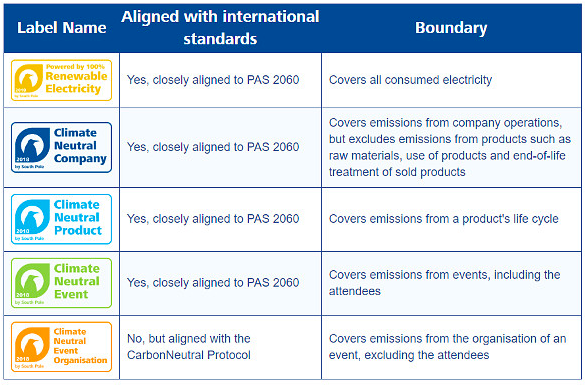 CH: The South Pole labels are closely aligned with international standards, such as PAS 2060, the leading international standard for demonstrating carbon neutrality, developed in 2014 by the British Standards Institution. The underlying greenhouse gas (GHG) accounting must follow recognised international standards such as the GHG Protocol or ISO 14064-1. The principles of GHG Protocol provide the basis for achieving the South Pole Climate Neutrality and Renewable Electricity labels. In addition, and reflective of South Pole’s commitment to long-lasting impact, the South Pole labels include the principle of ‘Conservativeness and Continuity’. In essence, South Pole uses only conservative estimates and will ensure that the clients aim towards continual improvements in GHG accounting and reduction potential. Sustainable Brands is a proud member of your ‘penguin label community’ — New Metrics’18 earned both the ‘Climate Neutral Event’ and ‘Renewable Electricity’ labels. For the benefit of our community, could you tell us in a few words how we got there? CH: New Metrics is indeed a great example for our “Climate Neutral Event” and “Renewable Electricity” Labels! Sustainable Brands realizes that events have an environmental impact — but without meeting and exchanging ideas, we would not be able to further develop the important sustainability agenda. That is why we help event organisers measure, reduce and offset the carbon impact of their events. For the Renewable Electricity label, we firstly defined the boundaries of the inventory. For New Metrics, this included all electricity consumption associated with the event, such as the use of light bulbs, A&V or delegates charging their phones. We then guaranteed that all (100 percent) electricity came from renewable sources by providing Renewable Energy Certificates, or RECs, for Sustainable Brands. The Climate Neutrality label also starts by defining the boundaries of the GHG footprint that will be considered. For Climate-Neutral Events, those boundaries cover the planning, marketing and execution of the event, including emissions from transport and accommodation for both organisers and attendees. The GHG accounting covers the direct emissions from sources controlled and/or owned and operated by Sustainable Brands (Scope 1), indirect emissions from purchased electricity, heating and cooling (Scope 2) and indirect emissions from business travel (Scope 3). Scope 3 is normally the biggest part at international conferences, and the reason why we work with organisers and encourage them to share relevant information about the emissions associated with business travel. The quantified carbon footprint covers at least 95 percent of the emissions from the event. In a second step, Sustainable Brands offset all remaining direct and indirect emissions by purchasing credits from our third-party-verified emissions-reduction projects that are in accordance with high quality standards, such as the Gold Standard, Verified Carbon Standard or the Kyoto Protocol’s Clean Development Mechanism. Achieving these two labels is an important way of leading by example. This month, you announced a new partnership with The Purpose Collaborative — can you tell us how it came about? What are some of the goals around your collaboration? CH: We’re all about building, facilitating and joining purpose-led/results-based collaborations for impact — social and environmental. We are thrilled to join the distinguished group of specialists at The Purpose Collaborative with whom we share the same mission — to help businesses on their journey to becoming more sustainable and truly driven by their purpose. We look forward to working together to assist companies in communicating and developing, in practice, their social and environmental purpose in a way that inspires, safeguards environmental integrity, and drives marketplace success.